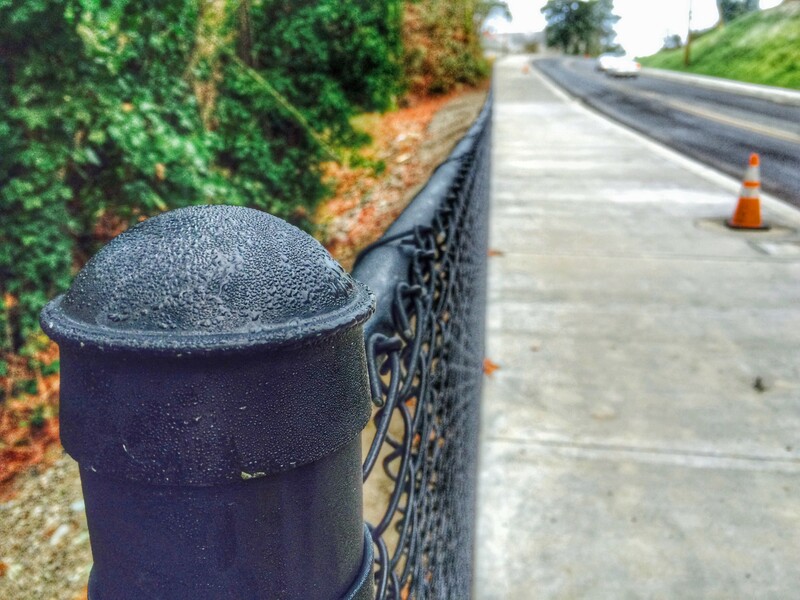 You may have noticed the two cyclone fences that were added to Lower Wheaton Way recently, as part of the city’s $3.4 million improvement project there. The fences were added at East 16th Street and where the road crosses Schley Canyon (pictured). This week, the project’s prettiest feature will begin to be installed: the road will be dotted with 30 foot tall decorative street lamps that look a bit like the ones on the Manette Bridge. UPDATE, Jan. 15: The lampposts have been delayed again due to a late shipment from a supplier. They’re estimated to be installed now sometime after Jan. 22. The project, which began late last spring, has installed a behemoth of a sidewalk down one side of the road (and a smaller one on the other side) to go with other pedestrian improvements. In the spring, the stretch will get paved as temperatures warm and bike lanes will be installed. The goal of the project is to further solidify the city’s Bridge to Bridge trail concept. — A new sidewalk will be added on the eastern side, along with crosswalks at 18th and Schley Boulevard (to go with the existing one at 14th). The crosswalk at 18th will include flashing yellow lights to warn motorists of a pedestrian crossing. Work on the sidewalks is expected to begin in mid-August, though the city has scheduled earlier work on portions outside a select number of businesses along the stretch to be less disruptive to them. Work on both sidewalks will begin in August. — Lights on the corridor will more than double to 37 from 17. They’ll be 30 feet tall, decorative — similar to the ones on the Manette Bridge — and come with LED lights. They won’t be installed until October January, late in the project. — A new intersection will be built where Lower Wheaton meets Cherry Avenue and Lebo Boulevard, near Harrison Medical Center. The traffic light there will be deactivated Friday and converted to a four-way stop. Additional intersection work won’t take place until August. — Lower Wheaton’s two intersections with Winfield Avenue and 14th Street will become one. Winfield and 14th will merge together and form a new roadway that will cut a small triangular park in half where it meets Lower Wheaton. The idea is to make it so Lower Wheaton pedestrians and bicyclists only have to cross one intersection, not two. The former road ends of Winfield and 14th will be landscaped with trees. That work is slated to begin in August. — Like the intersection above, the one where 18th Street and Marlow Avenue come into Lower Wheaton also creates a triangular green space. Instead of making a new road, 18th will be reshaped toward the south to meet Lower Wheaton perpendicularly, and Marlow, between Lower Wheaton and 18th, will be closed. That work, too, will start in August. — Much work will occur underground as well. Pipes that connect to the city’s sewer main that runs under the road will be replaced, though only a 50-foot portion of the main itself, near 14th Street, will be replaced. That work likely will occur in July. — The road’s water main will largely be untouched, determined to have much useful life left in it. But crews will be installing one new portion of the main, near the intersection with 14th, this summer as part of a separate project. — New stormwater catch basins will be added to Lower Wheaton, between the Manette Bridge and 16th Street, to give the road better drainage. That work begins immediately. Once it’s complete, crews will move to the other end of the project and install a new 650-foot stormwater main at Lower Wheaton’s intersection with Campbell Way, also to improve drainage. — Paving the road surface is slated for October Spring 2015.